← Grilling with Miso Glaze! My guess, most of you have never tried it, or even heard of it. That being said, I consider myself to lucky to introduce you to one of the greatest, most delicious foods I have ever and will ever try. West Sumatran (Indonesian) in origin, it is now considered a national dish for not only Indonesia, but Malaysia and Singapore. The flavor is everything good southeast Asian. It embodies most of the extraordinary essence we look for in south Asian cooking (Thai is the most logical western choice) and combines it in one dish. And what a success. 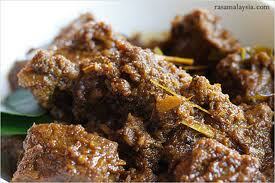 Rendang is no more than a beef stew done Sumatran style. Simmered in a mix of Indonesian herbs and spices, coconut milk and a little bit of shredded coconut, the stew is quite simple. But more often that not, simple, done right, can be the best. I think recipes that are really out of our comfort zones can be intimidating or unappealing. Why make something I have never tasted, never heard of, and certainly never cooked? Good question. In that case, may this post serve as information. Put beef rendang on your radar. Bury it in the back of your mind, so that somewhere, someday, when you do see it on a menu, you may have the delight of trying it. Then you can come back to this post and give it a try. You’ll want to, it’s not a dish easily forgotten. In a food processor, process the lime leaves, garlic, shallots, corriander, allspice and chiles until smooth. You will need to scrap down the bowl a few times. In a heavy bottom small stock pot, bring a little of the oil until the med-high heat. Season the beef with salt and fry, in batches, until browned on all sides. Add the lemongrass with the last batch. While the meat is draining, toast the pureed aromatics in the pot with a little fresh oil. When highly fragrant, add the beef and lemongrass back to the pot and stir until completely coated. Add the shredded coconut and sugar. Cook until slightly browned again and highly fragrant. Add the coconut milk, season liberally with salt, bring to a simmer, turn heat to low, and let cook, about 3 1/2 hours. If you find that the coconut milk is not covering the meat in the very beginning, add a touch of chicken stock. The meat should almost be covered. When done, it should be almost dry and the meat should be incredibly tender. The color should be dark. Check seasoning and add more salt if necessary. Remove the lemongrass. Serve with steamed jasmine, or sticky rice. Garnish with the scallions. I enjoy this with additional sambal, sweet soy, and chili oil.